If you provide personal contact information, Sporthorse Market d/b/a Dressagemarket.com is not responsible for any misuse of this information. Dressagemarket.com does not and will never sell or knowingly release your email address. Dressagemarket.com may use your IP address to help diagnose problems with our server and to administer our Web site. We use Google and other third-party advertising companies to serve ads when you visit our Web site. These companies may use information about your visits to this and other Web sites in order to provide advertisements about goods and services of interest to you. Our site's registration form requires users to give us contact information like their name, email, and postal address. The required fields are first name, last name, and contact email. 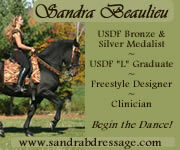 Dressagemarket.com displays the contact name, contact phone, contact fax, city, state and postal code with each listing. Dressagemarket.com does not display an owner's street address, with the exception of businesses listed in the directory. We never display a customer's email address on our ads, on our site, nor to anyone who responds to an ad. Dressagemarket.com does not sell or give your email address to any SPAMMERS or JUNK MAILERS. Our site uses secure online ordering for customers to request information, products, and services. The secure shopping cart system which collects financial information when orders are placed for listings is served by another site. Dressagemarket.com is not responsible for any breach of security from other sites and you agree to hold Dressagemarket.com harmless from the same. The information that is collected is used to enable the user to pay for products and services with our secure shopping cart system. It is not used for any other purpose. No credit card information is stored on the DressageMarket.com servers. Our online surveys ask visitors for demographic information (like zip code, age, or income level). Demographic and profile data is also collected at our site. This site contains links to other sites. Dressagemarket.com is not responsible for the privacy practices or the content of such Web sites. This site has security measures in place to protect the loss, misuse, and alteration of the information under our control. We do not save your credit card information online on our own server. Your personal information is password protected by your User ID and password. To protect your account, you can update your user information at any time by logging in and updating it through a form. By submitting a testimonial on DressageMarket.com, you are granting DressageMarket.com LLC a nonexclusive, perpetual, royalty-free, irrevocable and fully sub-licensable right to use, reproduce, modify, adapt, publish, translate, distribute and display such content throughout the world via any media. DressageMarket.com LLC reserves the right not to publish testimonials, to amend content of testimonials at any time and to remove testimonials from this website without notice after publication at DressageMarket.com's sole discretion. Publication of testimonials and content on the website does not signify that DressageMarket.com agrees, affirms, approves, supports or recommends the views and content given.